Does that giant, empty wall above your couch make you uneasy? 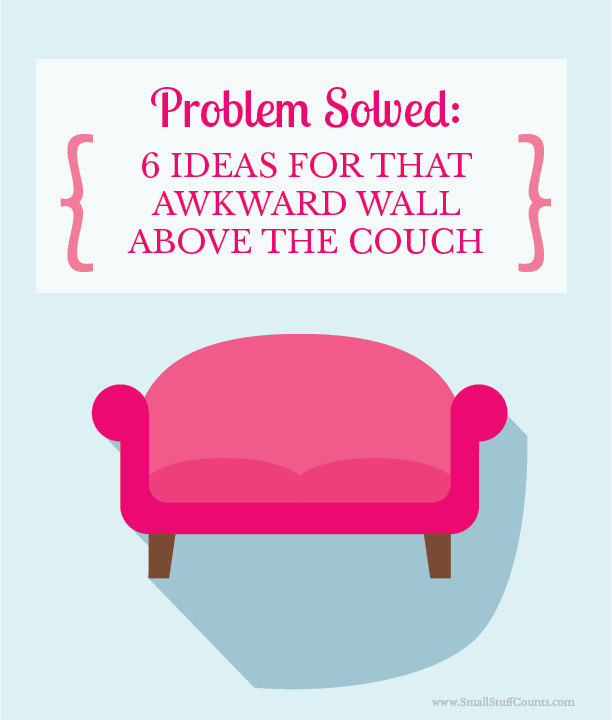 When a couch is positioned against the wall, it creates a large, awkward space that can feel intimidating to decorate. People often hang artwork above a couch, but they typically choose art that’s too small for the space and just can’t compete with the large sofa. Here are some stylish ideas to help you tackle that awkward wall once and for all. Make a statement with a huge mirror propped behind the couch. Mirrors add depth and visual interest, and they work wonders at filling a big wall and making your living room appear larger. This glam solution is amazing because it requires no nail holes, making it a quick project that is ideal for renters. Picture ledges are a fantastic way to display collections, especially if you like to rotate your decor frequently. You can simply prop your framed artwork and trinkets on the ledge without the commitment of a million nail holes. Ledges are perfect for switching out decor with the seasons. Consider adding lighting to draw more attention to your display. Gallery walls are all the rage right now, and that’s because they add so much interest to a room and create a fabulous focal point. They are an affordable alternative to purchasing a large piece of framed art. Gallery walls are a great way to display smaller artwork or photos that don’t make much of an impact on their own, but, when grouped together, make a big impact. Add variety to your gallery wall by mixing 3-D objects in among the frames (think small floating shelves, hanging vases, wooden letters, etc.). 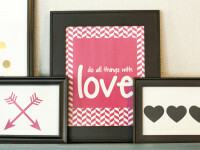 Put a twist on the traditional gallery wall of photos and instead create a gallery to showcase your favorite collection. Frame shopping bags from your favorite stores (because they’re just too pretty to throw away! ), frame postcards from your travels or frame a series of leaves or pressed flowers to add a touch of nature. Channel your inner Picasso and create an abstract work of art. All you need is a giant canvas, a paint brush and paint. The beauty of abstract art is that it doesn’t have to look like anything, meaning it’s a breeze to create a one-of-a-kind piece of art that is perfect to hang above your couch. Who says your home is too small for a library? Bookshelves are perfect for displaying vignettes that incorporate books and interesting objects. Pull out your couch a couple feet and add in bookshelves. To really make a statement, add floor-to-ceiling shelves. 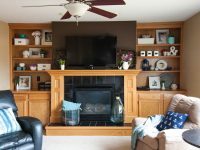 This creates a lot more storage space, a great place to display things, and brings that giant wall to life. No matter which of these solutions you choose, make it unique to you and reflective of your personality. Which of these ideas are you going to try? Can you think of other solutions for that blank wall? Share your plans and ideas in the comments below!